Your interpretation of the theme does not have to be literal. You can make it as literal or abstract as you like, as long as the inspiration is clear. Please bring a copy of your inspiration photo to the challenge reveal. Please have the mini quilt or pillow cover finished by our September 22nd meeting! For the inspiration photo, be creative- use a photo that you took that you really loved, or find one online that inspires you. Pinterest and Instagram are always good sources of inspiration. Also, Design Seeds is a good place to find beautiful photos with fun color schemes. But, if you choose to use a photo that's not yours, please give credit to the owner in any social media/blog posts! You will notice that I have Kona cotton colors next to the photo. 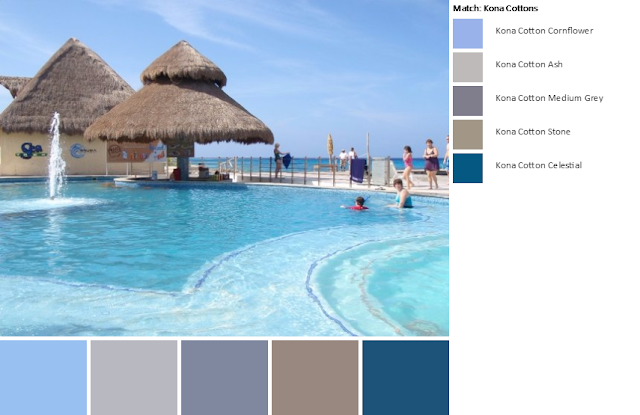 I uploaded the original to Palette Builder, which will give you either the Kona or the Moda colors that correspond to colors in your photo. Playing with the Palette Builder is a great way to find the color scheme that most inspires you. Using this color combination, I could create a mini in any pattern I chose. Or, from this photo I could also choose to make something that's pool/beach themed. Or something tiki hut themed. Or even swimsuit themed? The possibilities are endless, so go find something that inspires you and be creative.